In Brazilian music, Alberto Nepomuceno has become as important as Glinka, Albeniz, Smetana and Grieg have become in their own, respective, countries. Alberto Nepomuceno has not only been the precursor of musical nationalism in Brazil but he has also been considered its true founder. He did invaluable research work into native folklore, mainly through his magnificent Song-Book, thus preparing the way later to be followed by the great Villa-lobos. He, deliberately, kept in mind a11 that is Brazilian. Although, in his time, he fought practically alone, under the stress of violent opposition to which his reforms gave rise, he obtained memorable success with his vocal work when he managed to annihilate the age-old prejudice that Portuguese language was not fit for educated song. Alberto Nepomuceno was born in Ceará in 1864 and studied for many years in Rome, Vienna, Berlin and Paris, under such famous masters as Sgambatti, De Sanctis, Leche­titshi, Guilmant and Herzogenberg. In 1896 he founded the "Popular Concert Society" in Rio de Janeiro and, by this means, spread the works of Wagner and the modern French and Russian schools. Twice he was nominated Director at the National Institute of Music of Rio de Janeiro (1902-1903 and the Brazilian Government to conduct concerts of Brazilian music in Europe. He died in Rio in 1920 at the age of 56. Widely cultured, Alberto Nepomuceno could speak five languages and met many outstanding people, amongst whom were Mahler, Strauss, Cortot, Saint Saens, Debussy, Grieg, Casela, Milhaud and others. 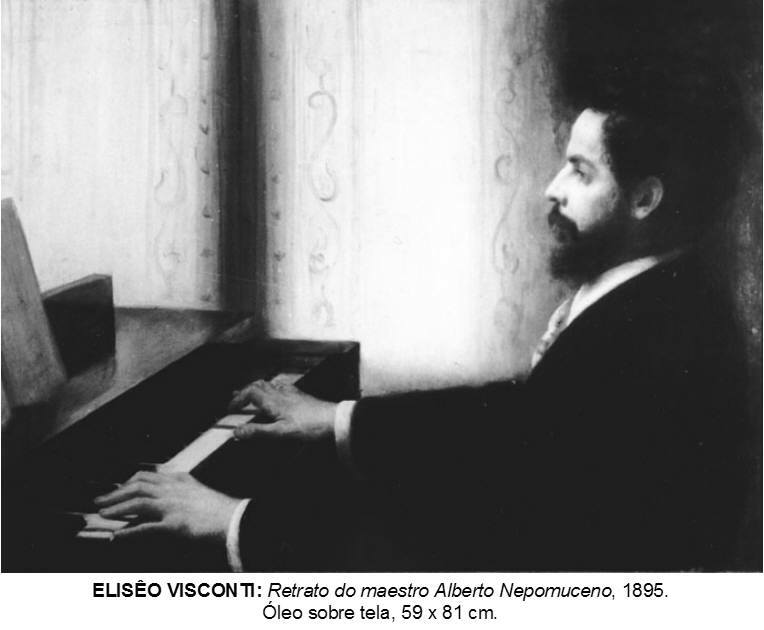 Open minded, apure idealist, Alberto Nepomuceno, in the whole range of his artistic activity, fought for the progress of the musical environment of his days. Unfortunately, he passed away just as modern Brazilian Music began to show promise. Of his varied and extensive works, two of his five operas should be especially mentioned "Artemis" (1898) and "Abul" (1899). then the music for "Electra" (Sophocles). "Pastoral" (Coelho Neto) and "Iriel" (Luiz de Castra); his Choral-Symphonic poem "As Uyaras", a legend of the Amazon and out of his three Orchestral Suites, the famous "Série Brasileira", which is true magnificent, as is the third quartet of the four quartets called "Quarteto Brasileiro", the Trio in F Flat, and a number of religious works, instrumental works and pieces for the pianoforte "Galhofeira", "Variações", "A Brasileira" and, finally, almost a hundred "lieders". It is in the "lieders" that Nepomuceno really shows himself to be a master of Brazilian music. SÉRIE BRASILEIRA - Orchestral Suite. This is the first conscious manifestation of a people freeing themselves from the dangerous influences that had originally chocked them. Composer Lorenzo Fernandez has rightly stated that the suite represents a true milestone in Brazilian music. Composed in Berlin in 1891, when the composer was twenty-seven years old, it was only performed in its entirety in 1897. Today, it is a classic in the repertory of national symphonic music. The suite is divided into four parts: "DAYBREAK ON THE SERRA" when the popular song of the "Sapo Cururú" and the tropical song of the "Sabiá" can be distinguished. The In1erlude is a whimsical, lively rhythm 50 typical of Brazilian folklore. "Rest in a Hammock", is a musical picture of a poignant poesy, a true treasure of refinement on Brazilian sentiment; 'here we are introduced for the first time to cultured Brazilian music, the characteristic B Flat. Finally, there is the "Batuque" a superbly wild rhythm, which 50 upset the orthodox critics of Nepomuceno's days. This was the work in which Nepomuceno first introduced the popular percussion instrument, called the "reco-reco", in classical music. ABUL - "'Dance of the Veil" and "Interlude" of Act 3. This opera was composed between 1899 and 1905 but was only performed on the 30th June, 1913 in Buenos Aires - conducted by Gino Marinuzzi where it was greatly applauded. It is a lyric drama mystic and religious, taken from a short story, by Herbert Ward. The action takes place in Chaldea Ancient Times. It is a skilful work of music with no native imprint, but it still represents a production of the greatest capacity, even if it is not the most original and the most spontaneous. GARATUJA - Prelude. This prelude is based on a short story written by José de Alencar. From the very beginning it was obvious that "Garatuja" was destined to become a lyrical comedy, the first authentic Brazilian opera as far as contents and form are concerned. Subject, environment, language, music, in fact the whole work, exhales the native sentiment of the composer, and it is probably for this reason that Nepomuceno felt more deeply about the work and considered it to be his best. Unfartunately, he was never able to terminate it. The Prelude, which is Nepomuceno's best-known and best-appreciated symphonic work, was composed in 1904. In it there can be found wit, charm and frank good-humour, all admirably orchestrated. The music describes the adventures of Ivo (a kind of Till Eulenspiegel of Colonial Brazil around 1700). In 1920, when Richard Strauss was conducting this work at the head of the Vienna Philarmonic Orchestra, he did not spare his praises when he spoke of the brilliant orchestration.